Forty years ago, the late Metrobank Group founder Dr. George S.K. Ty envisioned an institution that would serve as a venue to share the benefits of Metrobank’s success with the community. On January 8, 1979, Dr. Ty realized this by founding the Metrobank Foundation, Inc. (MBFI), armed with the vision for the institution to become the country’s premier corporate philanthropic foundation contributing a significant impact on social development. While the Bank has grown into an industry leader, MBFI has likewise built its own reputation through its various corporate social responsibility programs aimed at improving the lives of the disadvantaged and promoting excellence among key sectors of society. “Excel. Engage. Empower.” became the roadmap in all its giving-back initiatives to communities and stakeholders. Four decades since its establishment, MBFI sustained its mission to create and propagate a culture of excellence among its beneficiary sectors, provide solutions to stakeholder needs, and serve at the forefront to reach out to communities. 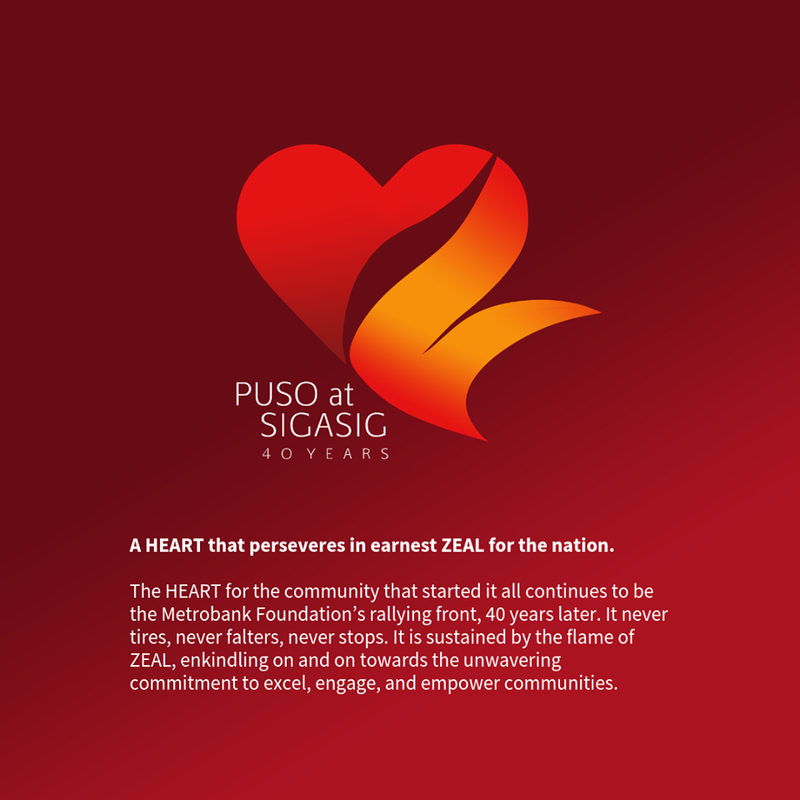 Guided by the theme, “Puso at Sigasig”, the heart for community that started it all continues to be MBFI’s rallying front, 40 years later. It is sustained by a greater zeal in order for the advocacies to move forward. The unique union of the heart and zeal forms the groundwork in the implementation of MBFI programs in public service excellence, education, healthcare, visual arts and heritage, and good governance. “Forty years and hundreds of meaningful collaborations later, hope has not waned; rather it persists with tenacity that the goals we have set will be realized. We look forward to stronger collaboration and broader spaces for multi-sectoral involvement of generations to come,” said MBFI president Aniceto Sobrepeña. In the years to come, the heart and zeal to build the nation and make a positive difference in the lives of many Filipinos remain strong and unchanging. 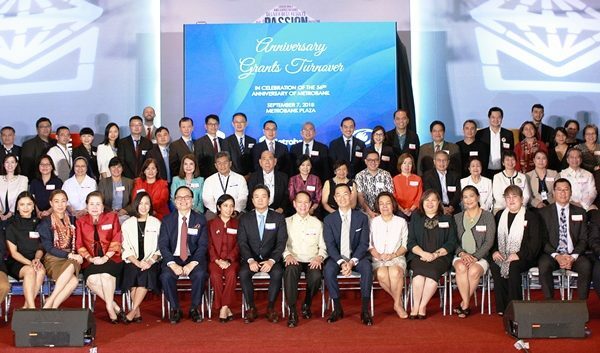 To celebrate the occasion, a special gathering to honor distinguished individuals and institutional partners, and to commemorate, at the same time, the memories of its late founder Dr. Ty, took place on February 21 at the Le Pavillon, Metropolitan Park, Pasay City. A new batch of awardees were conferred the Award for Continuing Excellence and Service (ACES). Chosen from the Foundation’s roster of awardees, they were recognized for their continuing excellence in the performance of their respective professions, substantive contributions to their chosen disciplines, and sustained outstanding service to their respective institutions and communities. For their consistent adherence to the highest standards of performance and conduct of duty, these exceptional men and women have set a worthy example for everyone to emulate. Equally competent, compassionate, and patriotic, they stand as symbols of a true public servant. They are distinguished based on the recognitions they received at the national and international levels, the kind of mentorship they have instilled among their peers, and the concrete impact they have left upon their respective spheres of influence and communities. 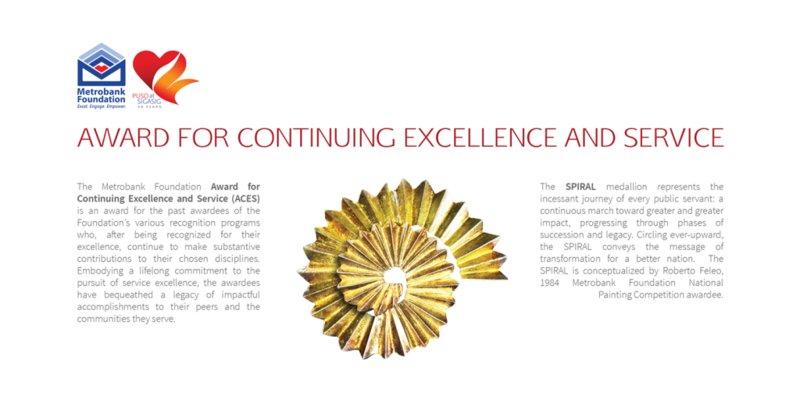 They received the ‘Spiral’ medallion created by 1984 Metrobank Art & Design Excellence (MADE) awardee Roberto Feleo. Another highlight was the presentation of the Partner in Empowerment, Advocacy, and Commitment to Excellence (PEACE) to institutional partners from the government, non-government and socio-civic organizations, media, academe, and business. They received the ‘Kapit-Bisig’ trophy created by 2011 MADE awardee Architect Jonathan Dangue. The work that MBFI does is a reflection of the late Dr. Ty’s enduring legacy to make a difference in the lives of the citizenry and contribute to nation-building. MBFI’s programs and advocacies illuminate Metrobank’s core values: passion for results, integrity, teamwork, commitment to customer service and heart for community. To commemorate Dr. Ty’s unparalleled leadership, generous spirit, compassionate heart, and outstanding contributions to nation-building, a special exhibit focusing on his being a pillar of the banking industry, corporate philanthropy, and as patron of the arts was put up. “The humanitarian legacy he left behind would continuously live on and ripple a lasting impact across the many lives touched, individuals assisted, organizations empowered, and communities positively changed through MBFI’s corporate social responsibility programs. We honor our late founder and express utmost esteem for his invaluable contributions to nation-building and boundless heart for the Filipino community,” expressed Sobrepeña. 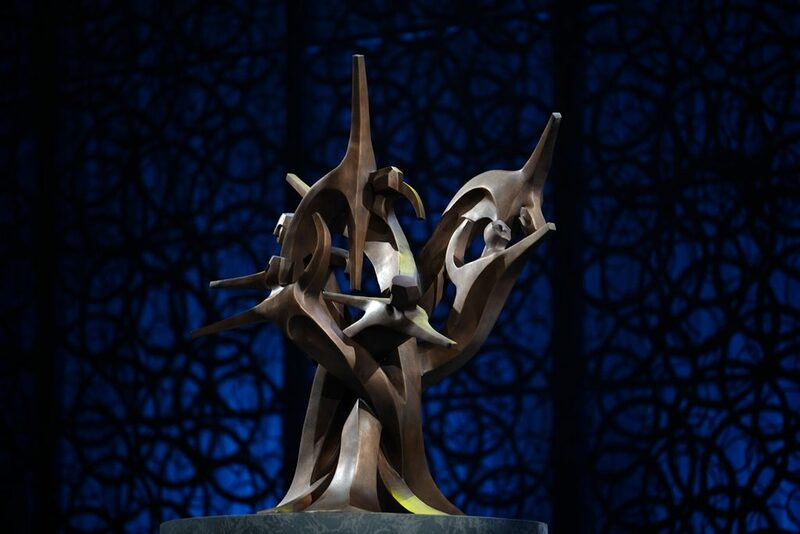 A sculpture entitled “Generosity” was presented which symbolizes Dr. Ty’s legacy in the industry and philanthropy. Created by 2007 Metrobank Foundation Prize for Achievement in Sculpture (MPAS) awardee Juan Sajid Imao, the artwork shows several human figures with their hands interlocking in stylized form. Sajid chose copper for the sculpture’s medium as it is naturally reddish in hue as a reminder of Dr. Ty’s lifelong passion to cultivate excellence in the fields close to his heart such as the arts, military, police and the academe. The dynamic movement of the figures, on the other hand, shows how Dr. Ty’s legacy of excellence will continue to inspire Filipinos to work together to make this country a more progressive nation. The exhibit also featured the milestones of MBFI in the last 40 years, together with dedicated photos and profiles of the ACES. To address the immediate needs of families affected by typhoon Ompong, GT Foundation, Inc. (GTFI), has allocated a total amount of PhP 5 million. To date, GTFI has reached out to a total of 6,100 families through a series of relief operations held in coordination with the network of Metrobank branches in northern Luzon. Relief distributions were held in three (3) municipalities in the province of Cagayan. 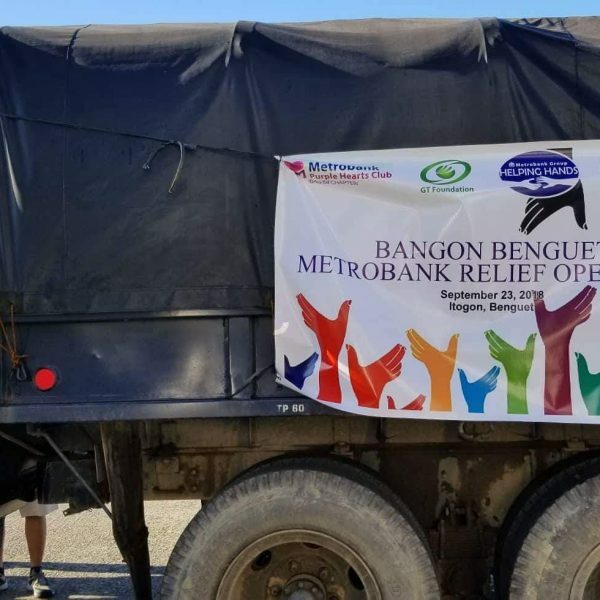 Spearheaded by Metrobank Tabuk City branch, 500 families were assisted in the municipality of Rizal covering barangays Linno-C, Poblacion, and Batu on September 25. Metrobank Aparri branch, on September 29, reached out to 500 families of barangay Maura, Aparri, Cagayan. Metrobank Tuguegarao branch, on the other hand, covered the hardly hit town of Baggao, reaching out to 3000 families of barangays Temblique, Adaoag, Asassi, Canagatan, Bagunot, Ibulo, Carupian, Masical, Taguing, and Bunugan last September 22. Relief distribution efforts were also coursed through the Archdiocese of Tuguegarao, benefitting a total of 1000 beneficiaries. Meanwhile, led by Metrobank Purple Hearts Club Bag-iw Chapter in Baguio City, relief goods were distributed to 500 families in Itogon, Benguet and Kayapa, Nueva Vizcaya on September 23. Packed meals were also distributed to 350 PNP rescue workers in Bakun and Itogon. Through Operation Blessing, 600 families in Kabayan, Benguet also received relief goods covering the barangays of Lusod, Tawangan, and Upper Bashoy. GTFI has also partnered with Alagang Kapatid Foundation in providing hot meals to disaster-stricken or homeless families through their Foton First Responder Food Truck. A total of 6,621 individuals were served with hot meals in the towns of Baggao, Santa Ana, Gonzaga, Gattaran and Rizal, Cagayan. Most of these areas reached through #AKFeed have been isolated as residents did not expect help to reach them, including an Aeta community in Gattaran. The Armed Forces of the Philippines (503 Infantry Brigade of the Philippine Army) and the Philippine National Police served as cooperating agencies in the transport of the relief goods. The Philippine Air Force (Tactical Operations Group 1) provided choppers to airlift the goods in Benguet. Metrobank employees and some chapters of the bank’s volunteerism arm, Metrobank Purple Hearts Club, were mobilized in the repacking and distribution of goods in the communities. GTFI is currently in coordination as well with the Philippine Red Cross to provide GI sheets to some 150 affected families for the repair of partially-damaged shelters. Together with Metrobank Foundation, Inc., GTFI remains responsive to aid survivors of natural calamities through relief and rehabilitation efforts. Organized by the Public Relations Society of the Philippines (PRSP), the Anvil is the symbol of excellence in public relations awarded by distinguished multi-sectoral jury to outstanding public relations programs and tools. MBFI was nominated for Grand Anvil, received the Anvil Hall of Fame, four (4) Gold Anvils and five (5) Silver Anvils. Awarded with the Anvil Hall of Fame is the “2017 Metrobank-MTAP-DepEd Math Challenge (MMC)”, the only math competition in Asia spearheaded by a bank that provides a venue for Filipino students both in public and private schools to hone their mathematical skills in an atmosphere of friendly competition. Over the years, it has produced national winners who get to compete and eventually win in international competitions. It is implemented in partnership with the Mathematics Teachers Association of the Philippines (MTAP) and the Department of Education (DepEd). MMC received its five (5) Anvil Awards in 2002, 2012, 2014, 2016, and in 2017. Meanwhile, awarded with Gold Anvil is the “2017 Metrobank Foundation Outstanding Filipinos” (OF) Award program. It is the most prestigious career-service award for exemplary public servants in the academe, military, and police sectors. In 2017, ten (10) Outstanding Filipinos—composed of four (4) teachers, three (3) soldiers, and three (3) police officers—have been recognized for going above and beyond the call of duty in their respective pursuits of service to the nation and its citizenry. 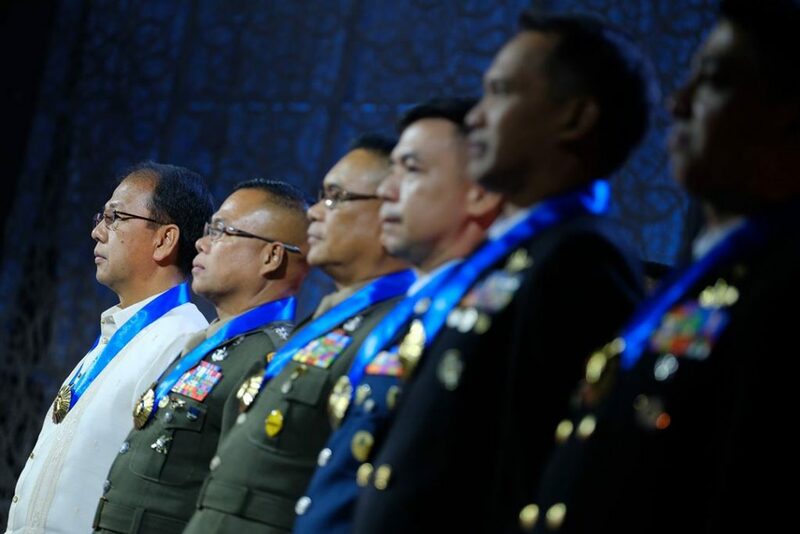 These 10 Outstanding Filipinos have formally joined the distinguished roster of 655 Outstanding Filipinos—360 teachers, 154 soldiers, and 142 police officers—honored by MBFI since 1984. Another Gold Anvil was given to “Metrobank Foundation Grants and Social Development Partnerships” program. Through this program, MBFI commits to help raise the quality of the poorest, most vulnerable, and underserved sectors by providing social development assistance to socio-civic, charitable, and development-oriented organizations that implement long-term, high impact projects in line with its adopted SDGs and the H.E.A.L (Health, Education, Arts and Livelihood) framework. 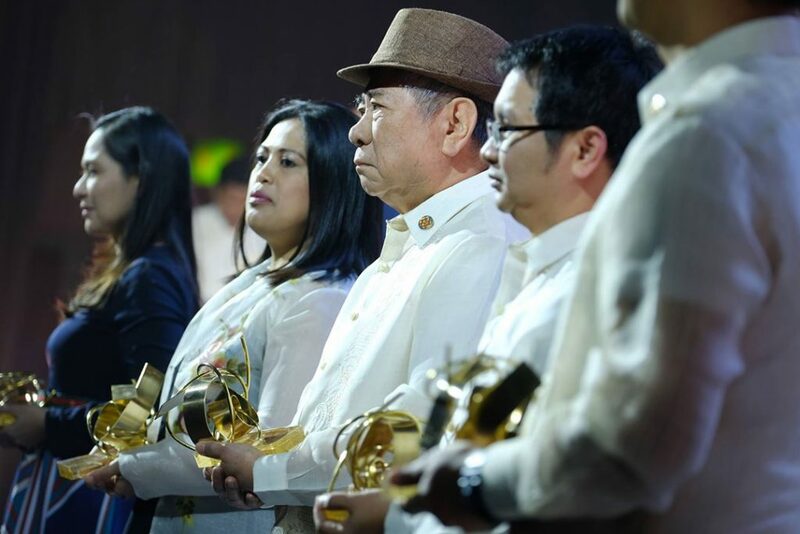 The third Gold Anvil was conferred to the “2017 National Teachers’ Month (NTM)”, a month-long advocacy campaign led by MBFI and the DepEd which recognizes Filipino teachers and educators and their contribution to national development—making the Philippines the only country in the world that celebrates Teachers’ Day for an entire month. Now on its 9th year, NTM has become an annual nationwide tribute recognizing the essential role of teachers in shaping minds and characters across all generations. Entitled “Beyond Excellence”, the MBFI 2016 Annual Report also won a Gold Anvil for highlighting success stories of select stakeholders instead of simply providing a report of the past year’s accomplishments. By focusing on human interest stories, the publication underscored the success of these CSR programs, not just in terms of numbers and statistics but also on how they created an impact on the lives of stakeholders. On the other hand, a Silver Anvil went to the “2017 Bags of Blessing”, a program spearheaded by the family foundation of Dr. George S.K. Ty—GT Foundation, Inc. in partnership with MBFI. Held every Chinese New Year, PhP 10 million worth of food packages benefit 10,000 underprivileged families nationwide. 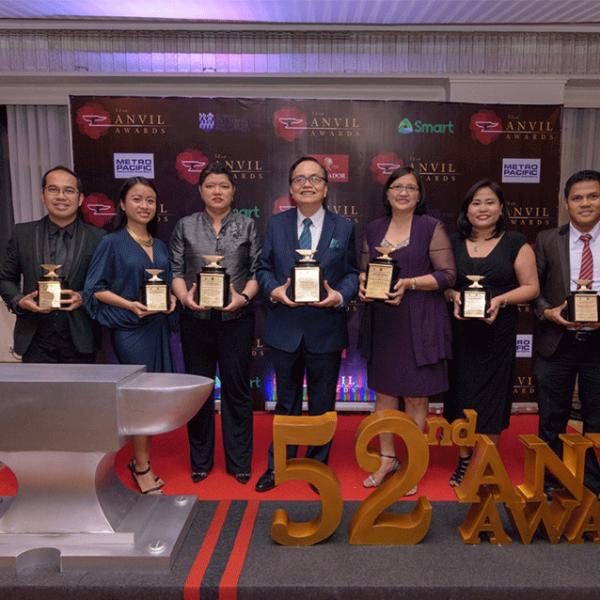 Moreover, under the PR Tools category, the Foundation also took home four (4) Silver Anvils for the following: Metrobank Foundation bi-annual newsletter “ExceLetter”; “2017 Metrobank Foundation Outstanding Filipinos Souvenir Program”; “2017 Metrobank Art & Design Excellence (MADE) Awarding Ceremony & Exhibit Opening”; and “2017 Art MADE Public”, respectively. MBFI has been winning Anvil awards since 1985. 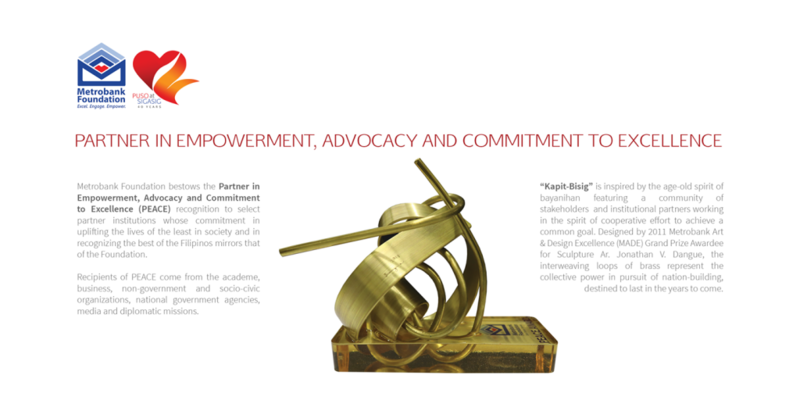 To date, it has won 77 Anvil awards for its various programs and public relations tools, including the much coveted Grand Anvil gaining the record as the first corporate foundation to win a back-to-back Grand Anvil (2009 and 2010) and 2 Platinum Anvils in the history of the award-giving body. 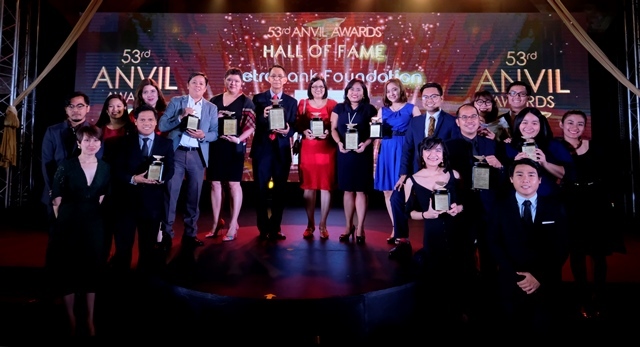 The Metrobank Foundation, Inc. (MBFI) took home seven (7) trophies at the 52nd Anvil Awards last March 10, 2017 held at the Rizal Ballroom of Makati Shangri-La Hotel. Organized by the Public Relations Society of the Philippines (PRSP), the Anvil is the symbol of excellence in public relations awarded by distinguished multi-sectoral jury to outstanding public relations programs and tools. MBFI received 3 Gold Anvils and 4 Silver Anvils. 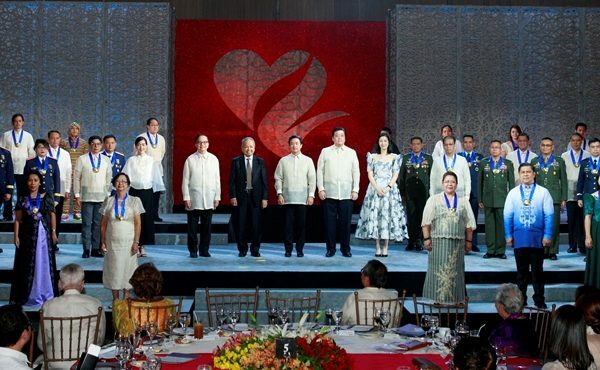 Awarded with Gold Anvil is the “2016 Metrobank Foundation Outstanding Filipinos” which honors exemplary individuals from the academe, military, and police, through its component searches—Search for Outstanding Teachers (SOT), The Outstanding Philippine Soldiers (TOPS), and the Country’s Outstanding Police Officers in Service (COPS). Another Gold Anvil was given to “2016 Metrobank-MTAP-DepEd Math Challenge” (MMC), the only math competition in Asia spearheaded by a bank that provides a venue for Filipino students to hone their mathematical skills in an atmosphere of friendly competition. Over the years, it has produced national winners who get to compete and eventually win in international competitions. It is implemented in partnership with the Mathematics Teachers Association of the Philippines (MTAP) and the Department of Education (DepEd). 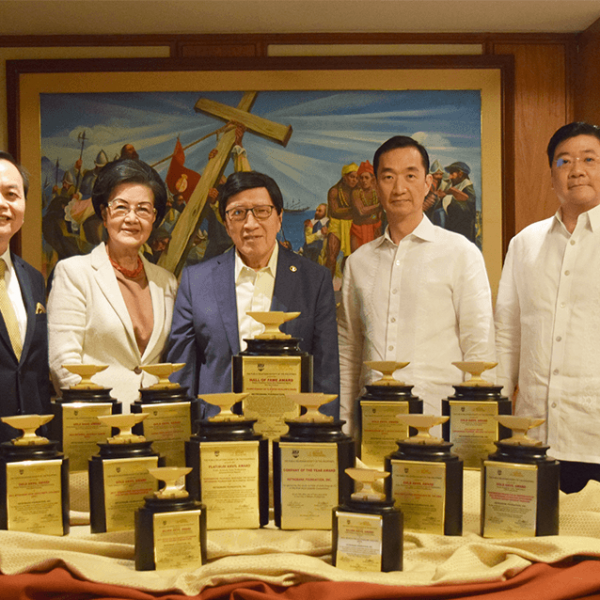 The third Gold Anvil was conferred to the “2016 National Teachers’ Month (NTM)”, a month-long advocacy campaign that engages different sectors of society to give honor and pay tribute to the teaching profession. In 2016, the movement gained grounds through the passing of Republic Act No. 10743 formally designating “October 5 of every year as National Teacher’s Day”. On the other hand, a Silver Anvil went to the “2016 Bags of Blessing”, a program spearheaded by the family foundation of Dr. George SK Ty—GT Foundation, Inc. in partnership with MBFI. Held every Chinese New Year, P10 million worth of food packages benefit 10,000 underprivileged families nationwide. 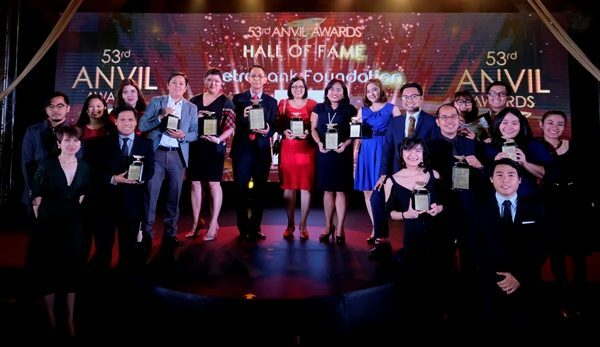 Meanwhile, under the PR Tools category, MBFI also took home 3 Silver Anvils for its “2016 Metrobank Foundation Outstanding Filipinos Unified Souvenir Programs”; MBFI 2015 Annual Report entitled “Dreams, Journeys, and Discoveries”; and “HEALing the Nation, One Grant at a Time” audio-visual presentation, respectively. MBFI has been winning Anvil awards since 1985. To date, it has won 71 Anvil awards for its various programs and public relations tools, including the much coveted Grand Anvil gaining the record as the first corporate foundation to win a back-to-back Grand Anvil (2009 and 2010) and 2 Platinum Anvils in the history of the award-giving body.